In selecting TDM strategies to address key public policy objectives, it is useful for planners to know how effective they might be. While the previous chapters provide guidance and references on emerging approaches to evaluate and model TDM effectiveness, the empirical evidence on TDM effectiveness is somewhat sporadic and incomplete. It is also difficult to compare across all measures, as the performance measures and method of evaluation vary from one measure to the next. Studies often lack controls, and significant exogenous variables such as the price of gasoline and unemployment rates affect travel behavior changes. With those caveats, some rigorous and thoughtful evaluations have been undertaken, and this chapter presents some of known impacts of demand management strategies. Much of this effectiveness research focuses on air quality benefits given the application of TDM to conformity and environmental issues over the past 20 years. After presenting some of the published findings on TDM effectiveness for all policy objectives, this chapter concludes with a master table of policy objectives and TDM measures that indicate the relative effectiveness of the strategies in measurably fulfilling the objectives. One Size Does Not Fit All – TDM effectiveness is highly dependent on the application setting, complementary strategies, nature of the travel market segment being targeted, and even the "vigor" with which TDM is implemented and promoted. Unlike many physical improvements, TDM strategies require some amount of education and outreach. This is all to say that the transferability of TDM strategy effectiveness is highly dependent on local conditions. Some of the more subjective evaluation findings on why a given TDM initiative was more successful in one location over another are issues such as the presence of a local champion, a history of alternative transportation, and the appropriate selection of a target market of travelers. So, to use another cliché, there is "no one recipe for success" when it comes to TDM effectiveness. There are "ingredients" such as parking pricing that are correlated to program success. However, correlation does not prove causality. TDM Impacts are Largely Localized – TDM effectiveness is most readily measured at a localized level, and this appears to be where the greatest impacts can be found. TDM is applied to specific worksites, developments, employment centers, venues, or activity centers. Localities with well-defined travel markets tend to produce the most readily available and significant impacts. When the impact of TDM at a broader geographic level is sought, say at the corridor, city-wide, or regional level, the localized nature of TDM effectiveness diffuses the results at a broader scale. One study of implementing mandatory trip reduction programs in the Twin Cities, with strong parking management in a mixed use setting, showed that the programs would reduce vehicle trips by 8 to 27 percent at affected worksites translating to only a 2 percent peak period traffic reduction on the adjacent interstate.168 However, small changes in demand (total demand or the spatial or temporal distribution of travel demand) can significantly affect traffic flow in congested locations and times. Likewise, the benefits of demand management accrue to both those who switch to sustainable modes as well as all travelers, including solo drivers (in terms of reduced delay, improved air quality, safety, etc.). Travelers Respond to Their Wallets - Most evaluation studies point to the overwhelming effectiveness of financial incentives and disincentives to manage demand. At one level, this makes sense as price influences demand in a classic microeconomic analysis. Cordon pricing in London and Stockholm have reduced traffic volumes entering the city center by as much as 20%.169 Parking pricing is another widely accepted demand management technique. Adding or increasing parking charges at worksites can produce dramatic mode shifts, as reported in Shoup's seminal reference, The High Cost of Free Parking.170 However, these examples relate to key disincentives to car use. In the U.S., TDM programs focused on modest financial incentives have been highly effective in inducing a shift to more sustainable modes. These incentive programs are often in the form of "Try-It-You'll-Like-It" inducements. For example, the Atlanta Clean Air Campaign's Cash for Commuters offers drive-alone commuters a daily cash incentive ($3/day) for using an alternative mode (carpool, vanpool, transit, bike, walk) for up to 90 days. An independent evaluation showed that the incentive caused 1,800 commuters to switch modes, resulting in 1,300 fewer vehicle trips and 30,000 VMT on the region's highways. More importantly, over 70% of incentive recipients continued their new commute mode after the subsidy lapsed, and half were still using a non-drive alone mode one year later.171 In the Netherlands, congestion management efforts have resorted to paying commuters to stay off backed-up highways during the peak, so-called Rush Hour Avoidance.172 Financial levers, even modest amounts, can influence travel behavior in a very significant manner. Parking Influences Travel Choices - Parking management is another widely accepted strategy to effectively change travel behavior, especially mode shift, time shift, and location shift. Parking pricing was mentioned above, but parking supply management can be effective as well. If parking is tight, meaning that all cars cannot be accommodated if everyone drives alone, commuters will adapt by sharing rides, shifting to transit, or even bicycling or walking if the distance allows. One study of developer TDM requirements revealed an 11-21% reduction in parking demand among worksites with aggressive TDM programs.173 Travel demand can be influenced by time of day and short- vs. long-term parking rates to reduce travel, including cruising for parking, during congested periods. Packaging is Key - TDM strategies are most effective when packaged into logical, complementary packages to realize synergistic effects. On the other hand, some strategies do not complement one another. One example of an unintended consequence from traditional TDM is flex-time and carpooling. Some employers who implement flex-time strategies as an employee perk or to address congestion at parking entrances have found that this can also serve to discourage ridesharing arrangements, which tend to do better with set work hours. At the same time, flexibility could reduce the peak period volumes and improve flow without changing mode split. Looking at some newer strategies, such as HOT lanes, efficiency improvements can also work to discourage some ridesharing arrangements. HOT lane projects which need to raise vehicle occupancy requirements from 2+ to 3+ in order to create sufficient capacity to sell may serve to break apart existing two-person carpools who choose to drive alone in the mixed flow lanes rather than pay a toll or find another rider. TDM is Not a Solution to All Transportation Problems – TDM can be highly effective at a relatively low cost (as compared to capacity enhancements) when applied in the right place, at the right time for the right travel market. However, TDM, in and of itself, is not adequate to solve congestion, air quality, energy, and other urban woes. Too often the expectations are unstated or disconnected from allocated resources and incompatible policies (e.g., developers are required to build a minimum number of parking spaces, often offered for free to employees and customers, that serves to generate even more driving).176 As mentioned above, TDM is most effective, or at least most measurable, at the localized level. The impact of TDM at a corridor or regional level is very hard to evaluate. Modeling and simulation, such as that done using employer trip reduction data to show the likely impact of TDM on I-5 in Seattle, suggests that aggressive and relatively widespread TDM programs at a local level can have a measurable and significant impact on a corridor.177 However, it is very difficult to measure empirically given issues of multiple influences, externalities, and causality. This clearly points to the need to carefully marry TDM strategies to smart infrastructure enhancements, such as ATM. When efficiency improvements are combined with efforts to reduce peak demand, the greatest impacts should be realized. The remainder of this chapter provides evidence of TDM effectiveness in terms of two primary areas of performance: travel impacts (mode shift) and environmental (emissions) impacts. Other impacts, including traffic and safety impacts and impacts related to goods movement, economic development, and livability, are touched upon. The known impacts reported are related back to the policy objectives discussed in Chapter 3 where possible. The chapter concludes with a comprehensive matrix of TDM strategies and their relative effectiveness in addressing key urban policy objectives. Mode shift (change in % use of each travel mode). VTR (reduction in the number of vehicles used by travelers adopting other choices). VMT Reduction (reduction in the amount of travel represented by shift in travel mode or location). From these performance measures, especially VMT reduction, a host of other performance indicators can be derived, especially those related to emissions (environmental) and energy use. Table 10.1 shows estimated ranges of TDM program effectiveness by type of program or strategy and level of transit service, as developed for site-specific TDM programs in Fairfax County, VA.178 In this table, "high" transit service corresponds to rail, "moderate" to peak-period bus headways of 20 minutes or less, and "low" to other conditions. These estimates of net mode shift were developed for the Fairfax County Department of Transportation, based on an assessment of various literature sources combined with professional judgment, in order to provide TDM planners with a basic understanding of the potential for mitigating trip generation, and therefore added traffic, from new developments. Other guidance has gone further than this simple table. One of the earliest FHWA guidance documents on TDM provided dozens of effectiveness look-up tables derived from the FHWA predecessor to the COMMUTER Model. The 1993 report, "Implementing Effective TDM Measures: Inventory of Measures and Synthesis of Experience,"179 provided charts showing the corresponding VTR for various employer TDM strategies applied to various starting conditions (as is the case with the transit conditions in Table 10.1). The existence of aggressive employer support programs (e.g. , guaranteed ride home) results in a 4-5% VTR in and of itself. The offer of alternative commuting services (e.g. , shuttle bus, vanpool) resulted in an average VTR of 22% as compared to 14% among worksites with the offer of these services. The existence of financial incentives and disincentives produced VTR results in the range of 23-30%. The TCRP report provides many look-up tables displaying the results of the 82-worksite analysis showing average VTR in the presence or absence of key TDM strategies and support elements. For example, Table 10.2 shows the relative effectiveness of combining financial incentives with other key employer program attributes, such as transit availability and support services. The case studies used in the analysis shown in the table are considered "top performers" and do not represent "average" impacts among all worksites implementing similar TDM measures. As such, these findings should be considered upper bounds of potential impacts. While many pedestrian streets were created in the 1970s (such as Boston's Downtown Crossing), they are experiencing a resurgence in places like New York City (recently banning cars from Times and Herald Squares) and San Francisco (currently closing streets in Golden Gate Park on Sundays and contemplating closing Market Street to cars). The VTPI TDM Encyclopedia187 summarizes the likely impacts of car-free treatments in Table 10.3, differentiating the impacts based on size of the application area (e.g., one or two streets versus a whole district). Finally, one other recent innovation is social marketing campaign to induce travel behavior change. TravelSmart Australia, a community and government based program encouraging the use of alternative modes, took a comprehensive community based social marketing approach to Adelaide in Western Australia. They compared participant behavior with non-participants and discovered that participants decreased in distance traveled over the study period at a rate of 10.4 km per household per day (18% reduction) and decreased car travel by 36 km. At the same time, non-participants actually reported an increase in distance traveled over the study period of 14 km on weekdays and an increase in car travel of 4.5 km on weekends.188 Such measures, also called Travel Blending and Individualized Marketing, have also been tested in Japan, Germany, and the U.S.
Rating– From 3 (very beneficial) to -3 (very harmful). A 0 indicates no impact or mixed impacts. LOS indicators have been developed for other travel choices (such as transit and bicycle LOS or HOV travel time reliability). 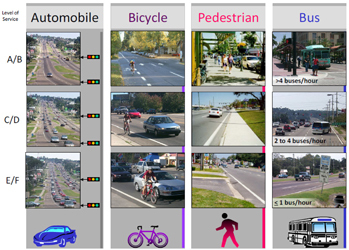 The Florida DOT has adopted a multimodal Quality/LOS system for four modes: car, bus, bike, and walk.189 Figure 10.1 provides a simple, visual representation of what the various LOS might look like, based on work developed by Florida DOT. The direct traffic impacts of demand management are amply demonstrated in three areas: pricing-related strategies including managed lanes, real-time traveler information, and active traffic management. As has been noted in Chapters 2 and 3, real-time traveler information is transforming the way transportation professionals can manage travel demand with technology and new dissemination mechanisms enabling short-term, spur-of-the-moment decisions made just before a trip takes place or even en-route. Individual benefits from traveler information are well-documented and range from avoiding congestion to reducing uncertainty and stress, saving time, and improving travel safety.191 These benefits are the direct effect of providing travelers with choices about the time, route, mode, and destination of travel. The value of these services is often gauged by the increased participation in and usage of these services. Nationally, the growth of 511 systems (both in number and in use) and traffic information websites is a well-documented phenomenon. Surveys of travelers and users of such systems show changes in behavior at an individual level; however, system-level impacts due to traveler choices have been evaluated through several simulation models. In addition to our knowledge on TDM effectiveness being focused on employer trip reduction programs, other evaluation results come from environmental studies. This is to be expected given the role of TDM in emission-reduction programs and conformity analyses. TDM impacts on reducing emissions not only address environmental policies, but can contribute to other policies, such as livability, sustainability, and even economic development (in the long run). The evaluation of TDM tends to assess TDM in terms of VMT reduction and convert these findings into emissions reductions via per-mile emission factors. VMT reductions can also be converted to energy impacts by applying energy consumption (miles per gallon) factors to travel reductions. Local and regional pricing and regulatory strategies that increase the cost of single-occupancy vehicle travel. Regulatory strategies that reduce and enforce speed limits. Educational strategies to encourage eco-driving behavior that achieves better fuel efficiency. Land use and smart growth strategies that reduce travel distances. Multimodal strategies that expand travel options. This last finding, on multimodalism, is critical in that it confirms the importance of providing more travel options as a cornerstone to TDM and sustainable travel in general, and it is also cited in the Urban Mobility Index reporting, prepared by the Texas Transportation Institute. TDM strategies can impact emissions in more ways than simply reducing VMT. One FHWA study of the ability of transportation strategies to impact multiple pollutants (Table 10.4) to shows how TDM strategies reduce emissions (e.g., VMT, trip, speed, idling reductions, time shift, or shift in fleet mix or fuels) for various pollutants.194 While the table does not provide estimates on the amount of emission reduction that might be expected, it serves as useful guidance on precisely how TDM strategies influence air quality and can assist planners in understanding the relationship between specific TDM strategies and air quality. Regional ridesharing programs (including carpool matching). Pricing programs (including parking pricing and congestion pricing). Miscellaneous TDM programs (efforts to promote alternative modes). Conventional transit service improvements (new lines, more frequency). Conventional fuel bus replacement $8.05/lb. Conventional transit service upgrades $12.30/lb. Park-and-ride lots (rideshare and transit) $21.50/lb. Modal subsidies and vouchers $23.30/lb. New transit capital systems/vehicles $33.20/lb. Bicycle and pedestrian programs $42.05/lb. Shuttles, feeders, and paratransit $43.75/lb. Telework, a common TDM strategy, was rated at the bottom of the list, as the least cost effective, due to the fact that the CMAQ analysis was evaluating public sector programs to promote telecommuting and that the programs evaluated largely consisted of telework centers, which can be costly in terms of capital and operating expenses, not the cost effectiveness of telecommute arrangements themselves. This type of analysis provides powerful evidence of the effectiveness and cost of TDM in meeting environmental objectives. Land use – TDM is often used as a mitigation strategy to reduce the additional trips generated by new development, and success cases revealing trip reductions on the order of 10-25% are fairly abundant. Land use and design issues, as a longer-term strategy, have the potential to increase non-automobile modes, as revealed in comparisons of the mode split between towns with and without good bike, pedestrian, and transit infrastructure. Livability – Measuring the impact of TDM on livability can be a subjective process. But livability might be seen as the product of several other effective roles for TDM, namely reduced congestion, increased safety, improved environment, and healthy economic conditions. Mostly, livability can be associated with increased travel choices, a fundamental purpose of demand management. The preceding sections have summarized some of the research on the known effectiveness of TDM strategies. The available impact information is largely based on the VTR impacts of employer-based TDM strategies and the emission reduction impacts based on the application of TDM to address air quality policy objectives. The impact of TDM on all the policy objectives enumerated in Chapter 3 have been touched upon in this chapter, However, this is an incomplete picture of the impact of the wide variety of TDM strategies included in this desk reference. Empirical evidence, in a form and amount sufficient to warrant comparative analysis, is not available for many strategies, beyond individual case studies. Likewise, impacts are often not expressed in comparative terms to allow for the evaluation of one type of TDM strategy against another. However, policy-makers and planners make decisions every day as to which TDM strategies to apply to a given project, problem, or policy objective. In order to assist in this process, the authors of this desk reference have produced a "master table" (Table 10.6) showing the relative effectiveness of some 32 TDM strategies in six categories (traditional employer TDM, land use, transit, parking, pricing, and systems management) as applied to the seven policy objectives discussed in Chapter 3. The key word here is "relative" as we are attempting to show whether a given TDM strategy will influence a particular policy objective in a significant way or simply contribute in a modest manner. Clearly, attached to each policy objective are a number of performance measures that would be used to measure effectiveness. In very general terms, highly effective equates to a greater than 10 percent reduction in travel among the target population; moderately effective to a 2 to 10 percent reduction in travel; and nominally effective up to a 2 percent reduction in travel (acknowledging that small reductions can have significant impacts on congested facilities). As implied, many strategies have not yet been evaluated in terms of their impact on a given policy objective. For example, we do not know the impact of HOT lanes on economic development, given the relatively new nature of this measure. We believe that these strategies will have a positive impact on addressing key policy objectives, but empirical evidence is not available from which to make a relative assessment. These relative ratings are based on the professional judgment of the authors of this report and are based on a review of available studies on TDM effectiveness and the authors' extensive experience with TDM evaluation. If used properly (as an initial screening tool to select TDM strategies to address particular policy objectives before further, more detailed analysis and modeling), this matrix can be a useful first step. TCRP, Report 95 – Chapter 19 – Employer and Institutional TDM Strategies: Traveler Response to Transportation System Changes, 2010. FHWA, Mitigating Traffic Congestion—The Role of Demand-Side Strategies, prepared by ACT, Report No. FHWA-HOP-05-001, October 2004. Shoup, Donald, The High Cost of Free Parking, Planners Press, 2005. OECD, Road Travel Demand, Meeting the Challenge, 2002. TCRP, Project B-4, Estimating the Cost Effectiveness of Employer-based Trip Reduction Programs, unpublished technical memorandum, 1995. Cambridge Systematics, Inc, Increasing the Integration of TDM into the Land Use and Development Process, prepared for Fairfax County Department of Transportation, draft final report, May 2010. VTPI, Online TDM Encyclopedia, updated 2010, http://www.vtpi.org/tdm/tdm118.htm and /tdm6.htm Accent Marketing & Research, Town Centres Survey, 2003-04, prepared for Transport for London 2004. Transport for Quality of Life, et al., The Effects of Smarter Choice Programmes in the Sustainable Travel Towns – Summary Report, prepared for UK Department for Transport, February 2010. 168 TCRP, Report 95 – Chapter 19 – Employer and Institutional TDM Strategies: Traveler Response to Transportation System Changes, 2010. 169 FHWA, "Managing Travel Demand: Applying European Perspectives to U. S. Practice," Report No. FHWA-PL-06-015, May 2006. 170 Shoup, Donald, The High Cost of Free Parking, Planners Press, 2005. 172 FHWA, Integrating Active Traffic and Travel Demand Management: A Holistic Approach to Congestion Management, prepared by ESTC for the International Technology Scanning Program, FHWA-PL-11-011, 2011, http://international.fhwa.dot.gov/pubs/pl11011/pl11011.pdf. 173 Spack Consulting, "TDM: An Analysis of the Effectiveness of TDM Plans in Reducing Traffic and Parking in the Minneapolis/St. Paul Metropolitan Area," January 2010. 174 TCRP, Project B-4, Estimating the Cost Effectiveness of Employer-based Trip Reduction Programs, unpublished technical memorandum, 1995. 175 OECD, Road Travel Demand, Meeting the Challenge, 2002. 178 Cambridge Systematics, Inc, Increasing the Integration of TDM into the Land Use and Development Process, prepared for Fairfax County Department of Transportation, draft final report, May 2010. 180 TCRP, Report 95 – Chapter 19 – Employer and Institutional TDM Strategies: Traveler Response to Transportation System Changes, 2010. 182 OECD, Road Travel Demand, Meeting the Challenge, 2002. 194 FHWA, Multi-Pollutant Emissions Benefits of Transportation Strategies - Summary of Findings, 2006. 195 Transportation Research Board, The Congestion Mitigation Air Quality Improvement Program: Assessing Ten Years of Experience, Special Report 264, National Academies, 2002. 198 FHWA, "Managing Travel Demand: Applying European Perspectives to U. S. Practice," Report No. FHWA-PL-06-015, May 2006 and Transport for Quality of Life, et al., The Effects of Smarter Choice Programmes in the Sustainable Travel Towns - Summary Report, prepared for UK Department for Transport, February 2010.